This spicy Vitamin A-rich relish is made from grated carrots, garlic, chili powder, and salt. The chutney is very simple to make and yet delicious. You can eat with bread, dosas, idlis, or pair it with rice and different types of rotis as well. Sprinkle ¼ tsp of salt on the grated carrots and set aside for half hour. Drain out the excess juices. Blend the garlic, chili powder, lemon juice, and the remaining salt to make a fine paste in the blender. Combine the carrots, garlic paste, and mustard oil, and mix well. Serve immediately or store in the refrigerator for 4-5 days to use later. 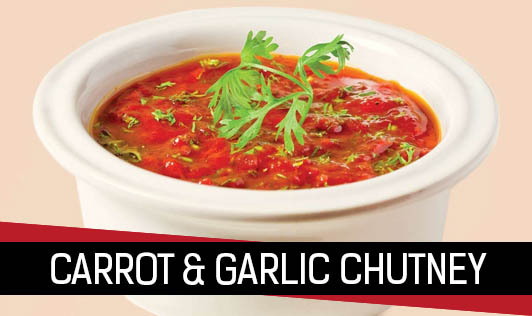 This carrot garlic chutney is super healthy with ZERO sugar added to it. Both carrots and garlic is a powerhouse of elements that provide multiple health benefits. Garlic helps in lowering blood pressure and enhances digestion. It also helps in relieving cold and cough. Carrots have the nutrient Beta Carotene which is a form of vitamin A which helps in prevent eye diseases and is also a rich source of dietary fiber that helps relieve constipation and lower blood cholesterol levels. Tip: Don't throw away the excess juice that you drain out. Refrigerate it and use it later to make stock for soup.